I’m always interested in the greater meanings behind particular items of clothing. We all know about fashion statements but some choices have more meaning than others. 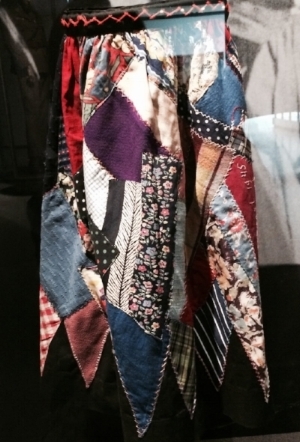 Like this skirt hanging in the Oorlogsmuseum in Overloon, the Netherlands. The Museum of the War is set up along the Liberation Trail, a path through the Dutch countryside which Allied Troops traveled in order to free the Netherlands from Nazi Germany in 1944-45. Mainly dedicated to questions of resistance by telling the stories of six “ordinary” Dutch people who lived during that time, the exhibits include everyday items: an id card, a diary, a suitcase, all displayed alongside the weapons of war that the Allieds used to fight for the freedom of Dutch people. 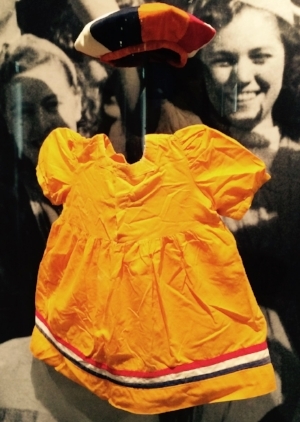 Initially, I was drawn to a corner of the museum by a little girl’s dress: brilliant orange with a band in the colors of the flag of the Netherlands at the hem. Turns out, it was sewn out of old bedsheets shortly after the liberation of Holland - the mother’s way of expressing herself at the celebrations that followed. Beside the toddler’s gown (with a sweet matching cap) was this skirt, labeled as “a liberation skirt.” What you can’t see in this picture is that in the upper right of the skirt, near the waistband, the date May 5, 1945 is sewn in. Resistance fighter Mies Boissevain, who was held in Ravensbruck, a slave labor camp for women, called on women to celebrate their liberation by sewing a skirt made of old materials cut into triangles as a symbol of reconstruction. The idea, she said, was to help women feel more connected when they saw each other in their liberation skirts and the process of sewing might help them to work through the pain of the war.